Limited Edition Print Co-signed by Bruce. Edition of 150 £20 each With Free UK P&P. Bruce Anstey on his way to victory in the Isle of Man Supersport TT in 2011 on the Padgetts Honda Supersport 600cc machine (and he won again in 2012). This Isle of Man TT art is a limited edition of only 150 prints taken from Billy's pencil drawing, A4 size (297x210mm) and is co-signed by the Flying Kiwi Bruce Anstey too. Bruce was the 'fastest' road racer in the world with a 133.975mph lap record speed at the Ulster Grand Prix that stood for 6 years to add to his other many road racing victories. Ian Hutchinson broke the 134mph barrier in 2016 with a 134.087mph lap. Below is Bruce signing his print and attending the 2012 Roads Closed exhibition at St Ninians Church organised by the Road Racing Supporters Club during the Isle of Man TT. They raise money for the Rob Vine Fund, Manx and Southern 100 Helicopter funds. This print has free UK post but I use 'Airsure' or 'International Signed For' for international orders so chose UK or international below to purchase the Bruce Anstey fine art print. If an international buyer wishes to purchase more than one print then please contact Billy with your requirements and one invoice with one International shipping fee will be sent to you. Bruce Anstey 2013 TT Padgetts Honda Fireblade Cartoon fine art print. Bruce Anstey riding the Padgetts Honda Fireblade Superbike in the 2013 Isle of Man TT races. Bruce scored a 3rd place in the Senior TT and the image here shows him riding past the famous Creg Ny Baa hotel on the 37.7 mile TT Mountain course. 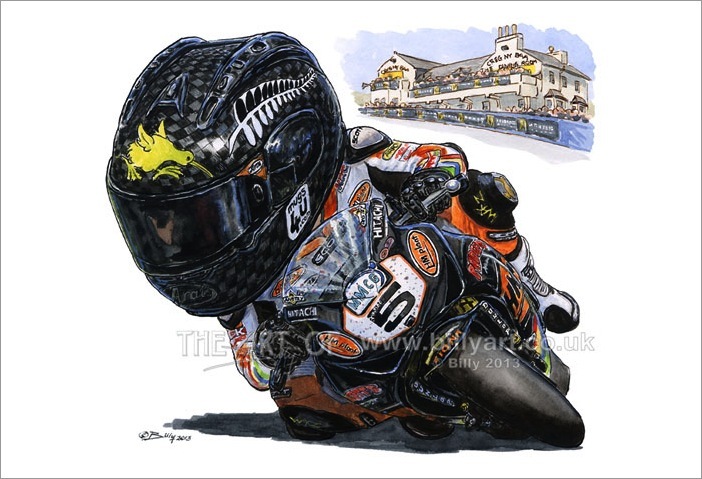 Bruce Anstey 2013 TT Padgetts Honda Fireblade open edition cartoon giclée fine art print.